These next two photographs are of a No. 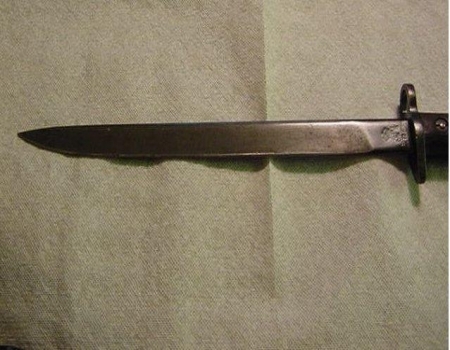 1 MK II India pattern bayonet. This is the second of the India pattern series and has an unfullered blade with a false edge. This style of bayonet will fit the No. 1 MK III Enfield rifle. These next two photographs are of the same No. 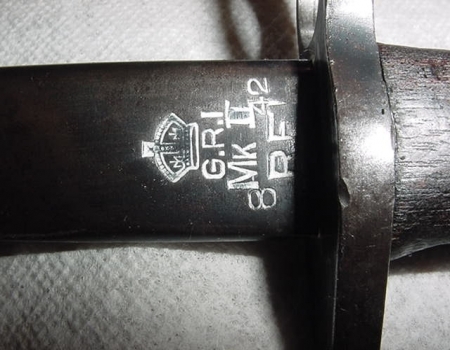 1 MK II India pattern bayonet from above. The pictures show the stampings that are found on each side of the blade. 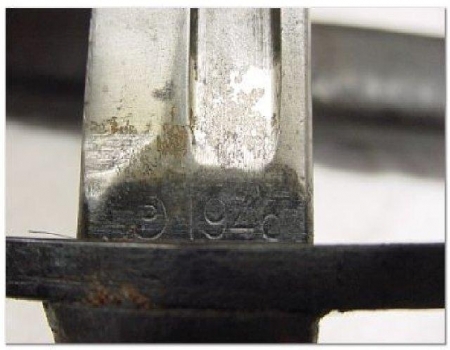 This entire series of bayonets was manufactured in India and contains the manufacturing designations as seen in the picture on the left. 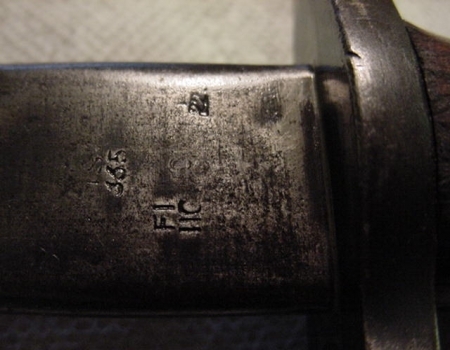 The stampings show the date of manufacture which was August of 1942,. The G.R.I. mark indicates Georgius Rex Imperator and the R.F.I. mark indicates Rifle Factory Ishapore. The white lettering in the photograph on the left is not original and I added this to the item after it was fully cleaned and inspected. This white lettering is not permanent and is easily removed. To learn what I used for the white lettering, please click HERE. These next two photographs are of a No.5 MK II bayonet. 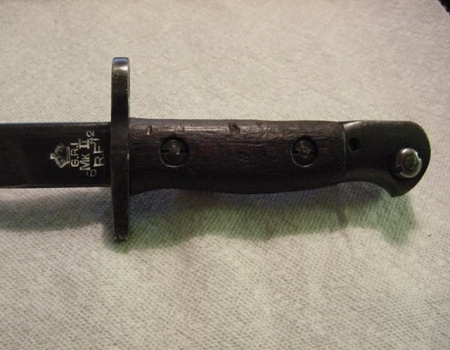 This bayonet was used on the Jungle Carbine also known as the No. 5 Mk I rifle, which was a derivative of the British Lee Enfield No. 4 Mk I. 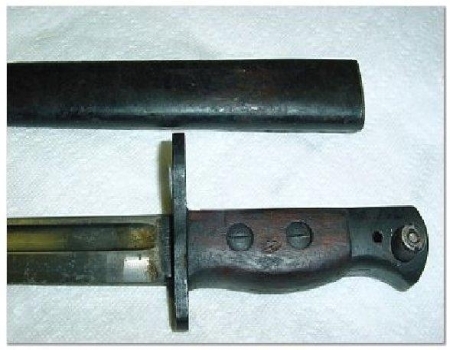 This bayonet is some what scarce to come by on the collector market and the price reflects it. An even scarcer version is the No 5 MK I bayonet. It is nearly identical to the example above except for that it has only one screw that fastens the grips. 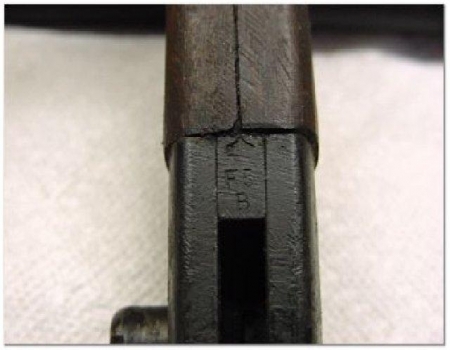 This photograph is a close up of one of the markings that was found on this No.5 MK II bayonet.